In 2017 Oral-B launched the Pro 2 2000. This is a replacement to the Pro 2000 being compared below; note the extra ‘2’ in the product name for the newer model. The only difference is the battery. It has been replaced with Li-Ion, doubling the battery life.The 600 has not been updated.We therefore recommend reading our updated comparison, Oral-B Pro 600 vs Pro 2 2000, and purchasing the Pro 2 2000 (view on Amazon).We wish to make you aware of the different models to ensure you make the right comparison and are getting the brush best suited to you and your needs. In this post we’ll be looking at the Oral-B Pro 600 vs 2000. As usual we give the quick answer straight away, but the go on to explain in detail with photos and videos. As mentioned in the editor’s note at the start, the Pro 2000 has now been replaced by the Pro 2 2000 and we recommend opting for that over the Pro 600. The Pro 2000 comes with an additional cleaning mode (Gum Care) over and above the daily clean mode. The Pro 2000 has a visible pressure sensor. The Pro 2000 comes in 2 colours pale blue or pink with 1 brush head. The Pro 600 comes in 2 colours, pale blue or pink with 1 brush head but there are 3 different versions, the difference being the included brush head with each. The Pro 600 is generally cheaper. Detailed Comparison: what’s the difference between the Oral-B Pro 600 and Pro 2000? The number of differences between these two brushes are minimal and this is in part makes it difficult to actually determine which is best overall, but if we present the facts you can make your own decision. Let’s firstly focus on what sets these two apart. Primarily there are two key differences. The first is the cleaning modes. The Pro 600 comes with the Daily Clean mode, as does the Pro 2000, but the Pro 2000 also offers a gum care mode. Daily clean is the standard cleaning mode offered on all Oral-B brushes that lasts for 2 minutes. Gum Care mode is engineered to last for the same length of time but the 2,600-8,800 oscillations and 12,000-40,000 pulsations are less than the 8,800 oscillations and 40,000 pulsations offered on daily clean, thus making this cleaning mode suitable for those with sore or inflamed and even bleeding gums. The second and final major difference is the availability of a visible pressure sensor on the Pro 2000, which is something that the Pro 600 does not have. On the topside of the rear of the brush handle (the part I like to call the neck) that leads up to the brush head itself, is a red piece of plastic moulded into the handle. When in use, if too much pressure is applied when cleaning the teeth, an LED behind the red plastic lights up and gives a visual indication to your or I using the brush that we are brushing too hard. When the pressure is relieved, the light will go out. This is very handy if you are not used to electric toothbrushes or have been told you are brushing too hard as the brush will tell you when you need to stop. Even though the Pro 600 does not have this, the Pro 600 will reduce the amount of power delivered to the brush head if it detects too much pressure. You will not get the visual clue, but you will hear the sound of the motor change as it reduces the speed and fights the pressure. This applies to the Pro 2000. Generally speaking, once you are used to the amount of pressure you need to apply then you will never illuminate the sensor or very rarely, thus making it redundant. Whether it is of value to you or not, this will be for you to decide. That is the core differences, now to one or two smaller but perhaps important things to note. Both brushes come with either a pale blue or pink rubber strip running down the main brush handle. It is the blue colour options that are most commonly seen. There is a slight difference in the colour of the blue used on each brush, the Pro 2000 being the slightly darker of the two, but neither are as dark as the Pro 3000 and 4000. Both come with 1 brush head included in the box, normally this is the CrossAction brush head. However, the Pro 600 is sold in a variety of combinations. This means whilst only 1 brush head will ever come in the box, you can buy the Pro 600 with either a CrossAction brush head (most common), FlossAction or 3D White. The Cross or FlossAction are best. Whilst the 3D White will help whiten teeth, without the dedicated whitening mode the effects are limited. If you want a brush with a whitening mode look at the Pro 4000. And those are the differences complete. You know all you need to know or do you? Price can come into play too. Whilst we always prefer to recommend the brush that best suits the user’s needs, the Pro 600 is generally cheaper working out around 5p per day over 3 years compared to the 7p of the Pro 2000. Prices do always vary and sometimes there are some great deals on the Pro 2000. With that covered, here is just a bit of added information that we hope you will find useful and applies to both the Pro 2000 and 6000. The physical size and weight of the two brushes are the same. Both measure in at (with brush head) 23 x 2.5 x 3 cm and weighs 130g. Both have the coloured rubber grip that runs down the front of the brush handle and a power button that is accented in white. Grips above and below the button are present and the rear of the brush handle is a gloss white plastic with hard plastic grips. The lower third of the brush handle is where you will find the battery status and charging icon. The battery icon will run from green to orange to red as the battery depletes and when charging the battery and charger icon will slowly flash green. Dentists recommend a 2 minute cleaning cycle twice a day to maintain healthy teeth. A 2 minute cycle is broken down into spending 30 seconds on what is known as each quadrant of the mouth. With 4 quadrants in the mouth, (bottom right and left, along with upper right and left) you should spend 30 seconds on each during the 2 minute cycle. Both brushes have built in timers to assist with the 2 minute clean along with a quad pacer that alerts you to the 30 second intervals, so you know when to change quadrant. This process is repeated at least twice a day. You can clean more regularly if you like, but brushing too often can also do damage. Always try to leave 45-60 minutes after eating or drinking anything other than water before cleaning your teeth, if anything brush before eating. When purchased brand new, both come in the box with a charging stand that has a 2 pin connector that attaches to a shaver socket in a bathroom. If you do not have one, you can purchase an adapter to allow you to connect it to a conventional 3 pin UK mains socket. The built in battery is rechargeable and will last for approximately 28 minutes or 7 days, based on one user. To charge the brush, pop it on the stand and leave it typically 8-12 hours for a full charge. The brush can be left on the charger even if the battery is not depleted, it will not do any damage; although it is recommended to discharge the battery fully every 6 months. As standard both come with a 2 year warranty, this can be extended to 3 years, if you register the brush online. Both have interchangeable brush heads meaning you can choose what type of brush head works best for you and fits your cleaning regime. Some of these brush heads are better suited to certain cleaning modes not found on the Pro 600 or 2000 but can still be used. Whilst technically any of the Oral-B brush heads can be fitted and used on any of the cleaning modes, some are better suited to particular cleaning modes as shown in the following table. A feature that is not really marketed, but exists, is something called sound connectivity. By no means the most reliable option is works on the basis of an app on your iOS or Android smartphone using the built in mics to listen for the sound of the brush running. When it hears this it will provide an onscreen timer and log your cleaning schedule. All this based on you getting your phone out when cleaning your teeth, launching the app etc and then assuming the sound pickup will be reliable, which it is often not. It is a novel feature if you can see your cleaning records, but the Bluetooth option found on the Pro 5000, 6000 or 6500 is more reliable. Simply put: no. An electric toothbrush will ensure a more regular and balanced clean across the teeth and mouth than manual brushing might, but it still relies on the user placing the brush in the mouth in all the right places to clean effectively. With the right technique and the regulated cleaning modes you can find either will leave your teeth feeling and looking healthier, but if you are using the Pro 600 or 2000 on the daily clean mode, there is no known difference in their actual results; the only difference may be if you have specific needs whereby the Gum Care mode on the Pro 2000 will likely help achieve better results. We mention the importance of technique. The electric toothbrush can only do so much. We’ve therefore created a detailed guide on how to brush your teeth properly with an electric toothbrush. If you follow this, your dentist is more likely to praise you about the cleanliness of your teeth. Generally speaking, the Pro 600 is the cheaper of the two. At the time of writing the Pro 600 is available from £25 and the Pro 2000 £35. Sometimes the Pro 600 is a little more expensive but at this time there is a 2p per day saving, making the Pro 2000 7p per day to run over 3 years. Editor’s note: we now recommend the Pro 2 2000 over the Pro 600 – see the editor’s note at the start of this post for more detail. When the primary function of a toothbrush is to clean the teeth both of these models serve the purpose well. It is though the Pro 600 that wins for simplicity, value for money and just getting the job done. The Pro 2000 offers a little more with the extra cleaning mode and pressure sensor, great is you have sensitive gums but for those who have greater needs the Pro 3000 and above are better suited. Whilst the Pro 600 is the better all round package the complicated variants, including an option with a 3D White brush head, but no whitening mode does make it a little more complicated and confusing. The article was good but electric toothbrushes are NOT user friendly. They are a rip-off. Why? 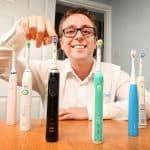 Within 6 months the battery runs out, and for an ordinary person with no engineering/technical background it is virtually impossible to change the battery, so you have to throw away a £30 – 60 toothbrush. It is strange that no engineer has managed to design a user friendly toothbrush where changing of the battery would be straightforward. My advise is Don’t buy, unless you have money to throw away! Thanks for taking the time to leave your thoughts and opinions. We have to disagree with your views slightly. Whilst we would love to be able to have the option of a ‘do it yourself’ repair and replacement to the battery, the way this would have to work would potentially jeopardise the design and water resistant nature of the electric toothbrush. There are AA powered electric brushes that allow users to change the batteries, but the drawback here is that these types of brushes are often less feature rich, bulkier and do not deliver the same cleaning power; but you do get the user replaceable battery option. I am going to presume by the fact that you left such a comment you have purchased the Pro 600 or 2000 from Oral-B but have had issues. You comment is a little generalised so it may have been another brush. Oral-B offer a 2 year warranty as standard, along with an optional 3rd years warranty to users, if they register the brush. Thus for 3 years, battery faults, provided not as a result of user damage would be covered under warranty. The battery would either be replaced or repaired under the warranty period. Outside of this, you would have to dispose of the brush but by this time, you hopefully have had 3 years happy brushing and achieved good value. Internal batteries are now very common in a lot of products and on the whole do not cause and issue. When they do, more often than not this is covered by warranty. If you can provide more details or still have the original purchase documents, subject to some conditions, you may still be able to have yours repaired. We have had an oral b electric brush for around 5 years, with two of us using it (with different heads of course). It’s been fantastic value. Don’t know the model sorry but would generally recommebd them. We now need a second brush and will likely buy the 600. Thanks for the info. Thanks for the comments, really pleased to hear this. While this comment is old, I would like to make things clear. Li-ion and NiMh batteries, as the ones used by toothbrushes are very reliable, but some do fail. While I agree that the battery should be easier to replace (it is easy for me, but I am an engineer who knows how to solder), you cant have inductive charge (without cables) and easy to change batteries. And for most people, it is better not to have a plug. Your case should be dealt by the warranty. very thorough and helpful! thank you! Thank you for the feedback. Did you make a decision between the two? Thanks a lot! I got the information that I was looking for. The two brushes are the same size. The whole comparison is very interesting and make sense very well- which e-brush to buy . I got al the information which I was looking for – to help in buying my first electric brush as recommended by dentist. Very useful, I have never had an electric toothbrush and this gave me all the facts I needed. Thank you.